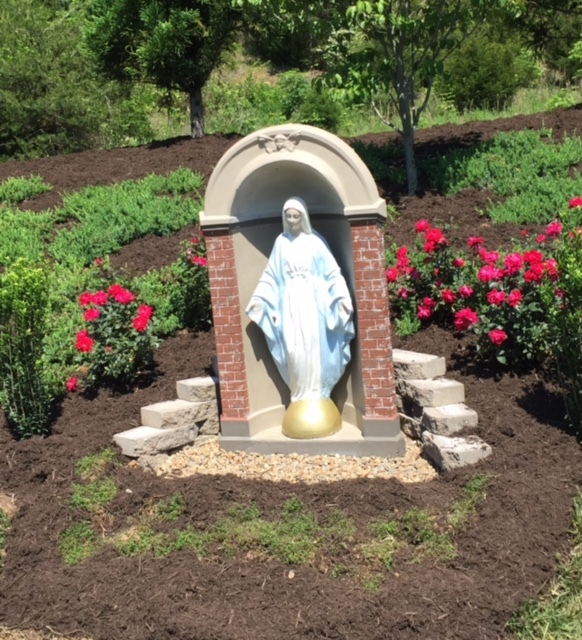 Welcome the statue of Our Lady of Grace to our Prayer Garden. Donated by Sandy Reagle. Our lady of Grace is also known as the Blessed Mother of Jesus. The name Our Lady of Grace, is derived from the prayer that begins, "Hail, Mary, full of grace…"
She is called the Lady of Grace because it is said that she can intercede for us when we ask for blessings from God. She bestows healing, forgiveness comfort, and graces upon the faithful. Our Lady of Grace is a depiction of the Virgin Mary humbly dressed in simple white and pale blue and her hands are outstretched, offering her love and help to all.